Leave it to the culinary team at Bistro West and West Steak and Seafood to come up with an original spin on the traditional Oktoberfest celebration. This takes place from 11 a.m. to 3 p.m. Oct. 12 under the tents at West Village in Carlsbad. Chefs Eugenio Martignago and Jason Connelly will be combining old-world German Oktoberfest favorites with dishes that highlight fresh produce harvested from the West Farm in Carlsbad. If you read my past column on West Bistro that highlighted Chef Martignago, you are aware of the culinary talent in the kitchen for this event. 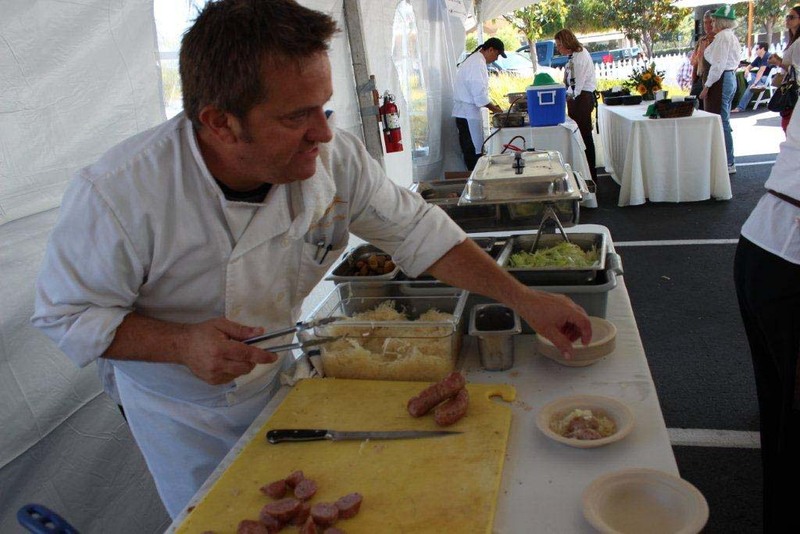 Before I get into a conversation I had with Chef Jason Connelly about OktoberWest, here is a brief history of the celebration. It originated in Germany in 1810, to celebrate the marriage of Prince Ludwig 1 to Princess Therese. The following year they added an agriculture show, to celebrate the harvest. Today it has evolved into one of the world’s largest fairs held annually in Munich. It is a 16-day festival running from late September to the first weekend in October with more than 6 million people from around the world attending the event every year. In Germany, it’s not called Oktoberfest, but “die Wiesn,” after the colloquial name of the fairgrounds (Theresienwiese) themselves. It’s an important part of Bavarian culture, having been held since 1810. Chef Connolly, a native to San Diego and a graduate of the California Culinary Academy of San Francisco, is a key player on a very strong kitchen team at Bistro West. Connolly comes to West having worked at Delfina in San Francisco and a number of prestigious San Diego restaurants over the years. He landed at Bistro West in 2008 where he has been a fixture ever since and a big part of establishing the kitchen there as one of the area’s best. He was my go-to for information on what to expect at the upcoming OktoberWest. What are some of the traditional German menu items we can expect? Chef Connolly: We will have our house made sausages including bratwurst and weisswurst, paired with house made sauerkraut and warm “German potato salad,” weiner schnitzel, spaetzel, suckling pig, schweinshaxn (pork knuckle), sauerkraut schnitzel, grilled fish, pretzels, braised veal cheeks, black forest cake and apple strudel. German beer is a staple of Oktoberfest; will it be represented at the OktoberWest? We will have St. Pauli Girl and Erdinger Weiss bier, but with such an amazing beer scene here in San Diego, and the rest of the country, we will also have some domestic beers, such as San Diego’s lightning brewery’s Elemental Pilsner, Firestone Walker IPA, Fat Tires Pumpkick ale, as well as some German and California wines. LTP: You have also put your own creative touches on the menu. What are some of the non-traditional food and beverage options available? Chef Connolly: From our farm we will pair our heirloom tomatoes with burrata cheese, a beet and goat cheese terrine and stuffed squash blossoms, also from our farm. Will any of the OktoberWest offerings be added to the West Steakhouse or Bistro West menu’s? C.C. : We currently have the heirloom tomatoes on the bistro menu, with fresh made to order mozzarella, as well as stuffed squash blossoms. We like to keep it special, so probably not. Though I do make all our sausages in house so we sometimes will have a bratwurst/weisswurst special at the Bistro. I’ve had their heirloom tomatoes from the farm last week for lunch with the made to order mozzarella and it was amazing. This whole menu sounds so good … and as much as I like a good craft beer, I think I’ll be sticking with a traditional German brew with my sausage, German potato salad, weiner schnitzel, spaetzel, suckling pig and other fare prepared by the culinary team at West Bistro. This is going to be a fun, delicious event and I’ve got it on my calendar to be there Saturday, Oct. 12 from 11 a.m. to 3 p.m. under the tents at West Village, 4960 Avenida Encinas, Carlsbad. Tickets are $35 per person and $40 day of event. Ticket includes seven generous food and wine/craft beer pairings. Must be 21 years of age to attend. Tickets are available at Bistro West. Call them at (760) 930-8008 or visit bistrowest.com.